Sold by BrandsBand and Fulfilled by Amazon. Gift-wrap available. Comment: Contains highlighting and/or writing. Ships direct from Amazon! Sold by BrandsBand and ships from Amazon Fulfillment. Leonard Richardson (http://www.crummy.com/) is the author of the Ruby Cookbook (O'Reilly) and of several open source libraries, including Beautiful Soup. A California native, he currently lives in New York. Sam Ruby is a prominent software developer who has made significant contributions to the many of the Apache Software Foundation's open source projects, and to the standardization of web feeds via his involvement with the Atom web feed standard and the popular Feed Validator web service.He currently holds a Senior Technical Staff Member position in the Emerging Technologies Group of IBM. He resides in Raleigh, North Carolina. The authors are geniuses and have deep knowledge on the whole web space. They also have firm idea on how web-apps and web-services have to be designed to make the entire web better organized, while (almost succeeding in) not being a religious fanatic on the design principles. Hence their presentation is deep and insightful. It opens up your eyes on simple, yet overarching principles of web (HTTP, URI, ...) and teaches you how considering RESTful-ness would improve your web service / app architecture. Like some geniuses, there writing style could be sometimes lengthy and pedantic, not compact. But their writing is still crisp and precise. Academic-degree preciseness. That may be why some are put off by this book but I view it as a small price to pay to learn from their wisdom. I found this book while designing REST API to use for our existing web application. Our web-app is a niche player, but very large and complex system and I was looking to add REST API to make the whole system more "modern". I had some doubt about the book from reading some of negative reviews, but after I completed reading it (on kindle during 8-hour flight), I was sold. The book answered my short term questions, and something much, much bigger and fundamental: RESTful way of looking at web service and applications. It actually convinced me that our web-app could have been designed much better had we known of RESTful / ROA principles and applied them early on. I definitely will remember to re-read this book when our web app/service project comes along. Sure... it's got its issues: very repetitive, some glitches here & there... 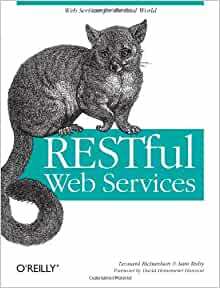 But overall, it's the best (if not the DEFINITIVE) guide to RESTful Web Services. If you've used SOAP and/or other Web Services-related technologies/schemas/etc. etc. etc. you should have no problem following this. For beginners, however, it is definitely not the place to start. You will need to read-up a bit more on Web Services in general and some of the options and practices out there. The repetition in the book isn't so bad. It drives home a lot of good points and covers quite a bit of in-depth information (sometimes too much, but it has come in handy when talking with other professionals/engineers). To work with Web Services and not have at least glanced over this book would be a huge mistake. Just be careful: it may take you a while to get through. It does get a little boring from time to time. Great information in the book. It was recommended to me by a professional acquaintance of mine and I'm very impressed and pleased with the book. 3.0 out of 5 starsEasy to read and learn, but you'll have to weed through some filler. As far as technical books go, this one is very well-voiced and easy to read and understand. However, there also seems to be a decent amount of filler sections thrown in just to make the book longer. It was helpful for learning REST, but I think it could have conveyed the same amount of useful information in a shorter book. REST is such a buzzword these days, it's important to get an understanding of what it actually entitles. This book goes through the major concepts and explains why each is important. The authors are very strict regarding the definitions and best practices, so you come away with a concise and clear understanding of desinging RESTful services. So if you want to know about REST and the how to apply, the design principles, what to do and not to do, differences between REST and the 'current' service oriented style of development - the book is extremely good at it! It's worth the buy. The topics are well explained and more so with actual systems like Flickr, Amazon's S3, del.icio.us etc., explaining what is/isn't RESTful about them. It has a ROA vs SOA chapter but you can guess on which side it would be tipped.